Is it just me who thinks the year is going insanely fast? March already? The countdown to my Birthday is on and Mothers Day is just around the corner, literally. Today's post is a little gift guide I've put together in the hope of giving you some much needed inspiration for Mothers Day. There is just 2 weeks (15th) to go until the big day its self, and with myself being a mum its something I truly look forward to as well. Now my two are at nursery and school age I love getting homemade cards from them and hopefully being waited over (never, ever going to happen). Candy Rose Collection Pink Hand Mixer - I don't know any mothers or women who don't like to bake. Most kitchens have these, but for those that don't, this is the perfect hand held electrical mixer. You don't have to spend an arm or leg on one, this works fantastically, its very powerful, and that's on the low setting. This cost me a little less than £12 in the sale (keep a look out), but the full price is an impressive £14.99. They come in a variety of shades including mint and cream. Perfume is one gift you can never go wrong with. These are just some of my favourites. Daisy by Marc Jacobs is a great choice, with Spring coming it's the perfect scent. I find the gift sets are really pretty and they tend to be the same price for a standard bottle of perfume. Don't sweat it if you cant afford perfume, looking around online and finding the best offer is key. Places like Fragrance Direct are perfect for finding a bargain or two. Warning - Shopping at FD will result in buying something for yourself. I've recently fell in love with Lulu Guinness. I receive the glitzy lipstick clutch for Valentine's and I won this tote bag too. The clutch, especially, is on the higher end of the scale at £95.00 (similar here for £75.00). The tote, however, is great value at just £35.00 and great for any mum who likes to shop in style (currently on offer for £30 here). I think it can be used for a clutch on a night out as long as the contents are kept to a minimal. There's various designs to choose from. I won my tote at Sacculos, they allow you to buy designer bags with a monthly payment plan. These are little ornaments that I just love to get. I'm a huge lover of snow globes and own several... They have various ones online from different brands. Another firm favourite of mine are the Willow Tree range, they are such good value starting from just £9.99 and really, really pretty. There such a meaningful, family gift. The Clairebella bags are widely popular amongst the cast members of Towie and the likes of soap star superstar Michelle Keegan. I love that you can personalise them with your image (cartoon style) and name. They are quite the quirky piece and will look amazing on the beach this Summer or just shopping in general. There's a limited edition Mother's Day jute bag that's just gorgeous, there's only 250 been made. These cost £39.99, but smaller sizes with cheaper prices are available. Baker Days are one of those brands I've seen everywhere. If it wasn't for fellow bloggers and the endless reviews I may not of heard of the company and their famous letter box cakes. Baker Day cakes are a great gift or treat to have with a cup of tea. They have a great selection of birthday and other celebration cakes, including Mother's Day ones. 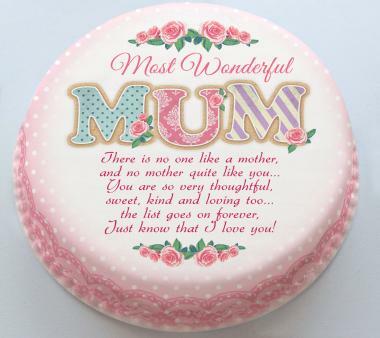 You can personalise the cakes with photos or get ones already created with beautiful words. There's also the option of various fillings; chocolate, fruit or on health preferences gluten and diary free. You can choose the size depending on how many people want to dig in. What makes them extra special are the fact, like no other cakes, they fit through the letter box. They also come presented in a beautiful cake tin. I think they make a great alternative to a box of chocolates. Prices start from £14.99. It's my birthday at the end of the month and maybe, just maybe I'll be treated to one. I'm also trying to push my boyfriend into surprising is cake loving Mum for Mother's Day with one of these and some flowers. Lastly, and a total must have are flowers. There's such a huge range of flowers out there from people who specialise in flower arrangements or just the local supermarket. They have gorgeous ones at supermarkets at affordable prices, so there's no need to break the bank. There's other bits and pieces that would make amazing gifts including some of my favourites from Toxic Fox or this skincare gift set from Stylelux. What about a subscription to a Beauty Box. This post contains items that were gifted to me from companies and family members. You've got a nice stuff dear!